The shortlisted books for this year's Canadian Children's Book Centre Awards exemplify some of the best work by Canadian authors and illustrators across the country. Go here for a complete list of nominees. Winners will be announced at a gala in Toronto on November 17th. And in the meantime, we're featuring the first half of our "Seeds of a Story" feature, in which writers and illustrations share the inspiration for their celebrated works. Don't miss "Seeds of a Story Part Two" as well. Delusion Road took me more than four years to write, but it’s been percolating in the back of my mind for more than four decades. When I was growing up, my parents never moved from the community where we lived, so I was fortunate to graduate with friends I’d known for many years. In fact, I attended a rural high school where everyone knew everyone else, so strangers in our midst were readily apparent. I recall sitting in an assembly during the first day of my senior year and seeing someone I didn’t recognize sitting alone a couple of rows ahead of me. Even all these years later, I vividly remember thinking how horrible it must have felt for that person to be “the new kid” who had to leave all of his friends behind and start from scratch in what was supposed to be his best school year ever. That memory is one of the seeds that grew into Delusion Road. Another seed that influenced and informed the writing of the novel is my environment. I live on Nova Scotia’s Bay of Fundy shoreline, and twice each day I watch the ocean rise and fall a vertical height of more than ten metres. Not only is it an astonishing sight but the force of those tides is nearly incomprehensible, possessing the kinetic potential to generate electricity for 100,000 homes once it’s harnessed. No small feat, though—a few years ago, a test turbine costing ten million dollars was destroyed in a matter of weeks by the sheer force of the bay’s powerful currents. 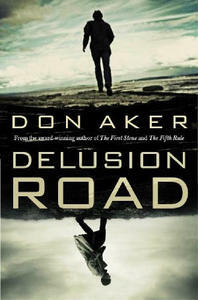 Having heard many accounts of people (usually tourists) trapped along this rocky shoreline by a rapidly incoming tide, I knew I would one day write about that experience, and so I have—the bay borders the fictional setting identified in Delusion Road’s title, and it serves as the backdrop of crucial scenes, including the climax. The third seed that gave rise to Delusion Road was, for me, the most compelling—the prevalence of violence against women, especially those of Aboriginal heritage. Statistics Canada tells us that half of all women in our country have reported at least one incident of physical or sexual violence since the age of sixteen. Just as staggering is the statistic that less than ten percent of all sexual assaults are reported to police. This societal problem simply cannot be ignored, and the more I encountered stories about it in the news, the more I realized I needed to address it in a story of my own imagining. IfDelusion Roaddoes nothing else, I hope it gets people talking about the victimization of women and what each of us can do to ensure a better world for our daughters, our partners, our mothers, and our friends. The Masked Truth has a unique seed for me as a storyteller. Normally, I come up with a basic idea—the “What if?”—and then build around it. 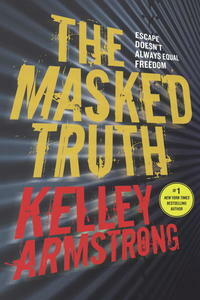 Instead, The Masked Truth began with an issue I wanted to address: teen mental health. I wanted to show characters dealing with mental health issues in a realistic way, managing both the problem and the stereotypes surrounding it. 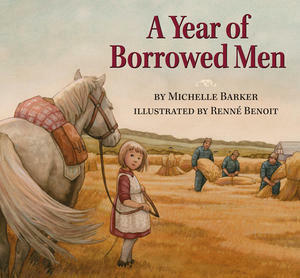 A Year of Borrowed Men began as a homework assignment. I was taking a class on writing for children in the UBC Master’s program in creative writing. We were working on historical fiction and our professor, Maggie de Vries, asked us to choose a period of history that interested us and write something for children. My mind leapt naturally to the stories my mother has told over the years about growing up in Germany during World War Two. The first image that came to me was of the catalogue Christmas tree she’d described, in which she’d cut photographs from a clothing catalogue to decorate the tree for the prisoners of war staying at her family’s farm. I called her and we spoke at length about the time her family had hosted these three men: the details of Christmas time, how she’d found ways to communicate with the men, the doll she’d received that had melted on the stove. When I first wrote the story, it was all about that one Christmas. 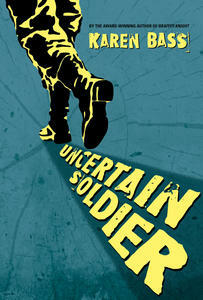 Over time the story’s shape changed but the question that resonated for me throughout was: how would a child process war? How would she make sense of the things happening around her? That was how the notion of borrowed men arose. When I worked in a library, a patron told me he’d seen German prisoners of war in northern Alberta, near where I grew up. I was surprised so I searched for proof. When I found it, Erich’s tale began. The other part of the story started with a phone call from an old friend of my father’s, who told me he liked my first book. Then he explained about his childhood during the war, as a Canadian-born son of German immigrants who had been horribly bullied by his classmates. Thus, Max was born. From there the two storylines wove together. Carolyn Beck: One sunny day in late August 1999 while hiking through a wooded section of the Bruce Trail I came across a sun-dappled stream and was compelled to sit down on a mossy rock, pull out my notepad and wax poetic. That was where quite a few bits of the poésie in That Squeak came from. But that moment also dredged up the summer days of my childhood when my best friend and I would sneak away from our suburban neighbourhood on our bikes and pedal out to the back fields outside of town. No one ever knew because if they did we would have been forbidden. It was a shared secret. I have never lost a friend to an accident. But at the time I was sitting on the boulder by the bubbling stream, I did not have a close friend. All my friendships had somehow withered away as quietly and as stealthily as a garden in autumn. So I see That Squeak in which Joe has lost Jay and will soon lose his new friend, Carlos, as an exploration of the memory of friends, the gifts we inadvertently give each other, the influences they have on our characters, how they make us see things from other perspectives and how, present or gone, they remain a part of us. Forever. 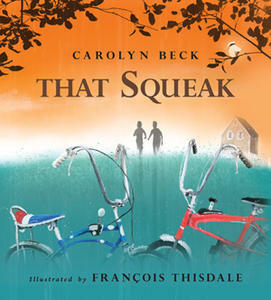 François Thisdale: When I read for the first time that moving story by Carolyn Beck, I was immediately inspired by two topics that followed me as I created my illustrations: bicycles and that story of friendship and loss. About friendship and loss, like Joe, I has lost my best friend. 14 years ago, my friend died from cancer. I've found it really hard to go through that situation but after months and years, I realized that friendship never dies and stays forever. I also realized that my friend, even dead, still helped me to enjoy the present, to live in the moment, simply enjoying being there. And all these memories helped me to be inspired during the project. Also, on a lighter note, I do love bicycles! I'm riding my road bike daily, an Italian race bike, for a 35-40 km ride. I've reached nearly 5500 km this year now. So, doing illustrations for a book about bikes has been wonderful. I decided to locate the story in the ‘70s and work on banana-seat bicycles. Why banana-seat bikes? Cause I was born in 1964 and during the ‘70s, it was the era of this kind of bikes. Riding my banana seat bike during my childhood was something really important to me, the best way to live friendship and to spend great summertime in Montreal. The idea to write a book about immortality wasn’t entirely mine. Karen Li, of Owlkids Books, approached me with the concept. I went away to see if there was, in fact, a book there. Of course, there was! With the “seed” of the idea in mind, I immersed myself in research. 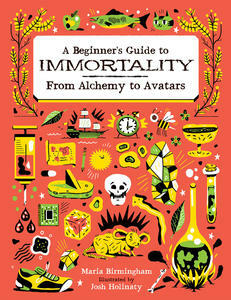 My question at the start was: How has immortality factored into human history? I discovered that the quest to live forever is at the heart of one of the first stories ever written. And that immortality pervades mythology and folklore, popular culture, and science. In the end, the focus of the book became not just immortality itself, but also the endless fascination that humankind has with this notion of living forever. As I finished writing, there were still questions left to answer, including: Why do we have this desire to live forever? I tried to address that as best I could. Of course, the biggest question of all—and the one that ends the book—simply can’t be answered, at least not now: Can we live forever? But, hopefully, that final question will plant a “seed” in readers’ minds that they’ll consider long after they finish the book. I became interested in the girl problem when several friends of mine adopted baby girls from China. This interest led me to read an article in the Canadian Medical Association Journal, which is one of the journals I work on as part of my day job in digital publishing. The article analyzed the effects that ultrasound technology has had on the gender balance of certain countries including India and China. It was a true eye-opener for me, not because it discussed what was happening to girls (which I was at least partially aware of, especially in China) but because it also discussed how this imbalance will affect boys in the future as well. It was the authors’ prognostications for the future that became the seeds for my setting in 5 TO 1. I combined the political and personal decisions that had created the gender imbalance in these two countries and then let them fester for 40 years. I tried to imagine how people would attempt to fix these problems and how, in doing so, they would fail. And that became Koyanagar, the setting for my story. Melanie Florence: Missing Nimama was actually born in my editor’s old office where were meeting to talk about another project. I was leafing through another book she edited called The Stamp Collector. 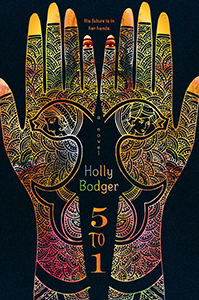 Without even looking up, I said, “Can you imagine a book like this about a missing Indigenous woman?” Christie looked at me and then yelled, “YES!”, as I remember it. I had been reading a lot about missing and murdered Indigenous women but not in mainstream media. In fact, I was finding that it wasn’t something that was being talked about as much as it should. And the people left behind when they lost their loved ones weren’t being heard. Their loved ones were missing or murdered and no one was listening. I wanted to give those women—the missing and murdered—a voice. And somehow it turned into wanting the people they left behind to be heard too. I wanted to tell the story of a little girl who is forced to grow up without her mother, but who still feels her presence. As a mother myself, I knew that if it was at all possible, Kateri’s mother would still be there, watching over her little girl. My hope was to bring attention to a very serious, sad subject while writing a story that was ultimately hopeful and beautiful too. 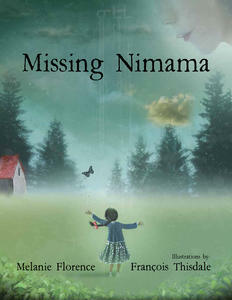 I wanted Missing Nimama to be a love story between three generations of Indigenous women. François Thisdale: That wonderful story by Melanie Florence is a very special one. My first reading was a deeply moving one and immediately, I felt under the spell. This story seemed made to correspond with my style and it inspired me strongly. Kateri has lived through difficult moments for someone so young. It reminded me a bit of my daughter. This is quite different but we adopted her 14 years ago and around the age of 8 she could felt sad and uprooted when thinking about her past and her Chinese mother, knowing that it would be impossible to know who that woman was and why had she abandoned her. However, my daughter built her strengths upon her weaknesses, which was a quality I found in Kateri. This comparison inspired me to create these illustrations. About my artwork, I decided to add some specific elements as transparencies. Cree words have been put here and there to increase the importance of Cree Culture and to situate that story in that context. The butterfly, kamamakos in Cree language, was the nickname her mom gave to Kateri. That's why I put plenty of butterflies through the scenes. Take a look, and you'll find one of these on about eight spreads. The table with the red phone in the book is a table done by my wife's granddad, a very talented blacksmith who worked with butterflies on that special piece of art. A lot of my story ideas happen when I'm NOT writing or trying to think of ideas, and I am away from distractions like computers and phones. Often I’m on hikes, where I brainstorming ideas with my husband, or I’m talking with friends, many of whom are fabulous storytellers themselves. The idea for Clover's Luck was one example of this. One summer, while I was teaching a writing camp for kids, one of my friends, another instructor at the camp, described to me how he worked at a humane society. The stories he told of his experiences there were very powerful—even heart-wrenching. On the drive home from the camp, I wondered: what if there was a humane society for magical animals, like dragons and unicorns? That was the start of the idea. I based the main character, Clover, on myself. 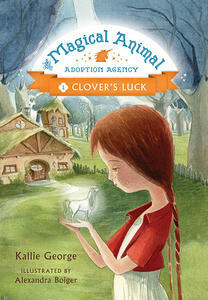 I love animals, but, like Clover, I have bad luck when it comes to keeping pets. I’m allergic to cats, and live in an apartment where I can’t keep a dog—or a horse. A fairy horse would really be my perfect pet!